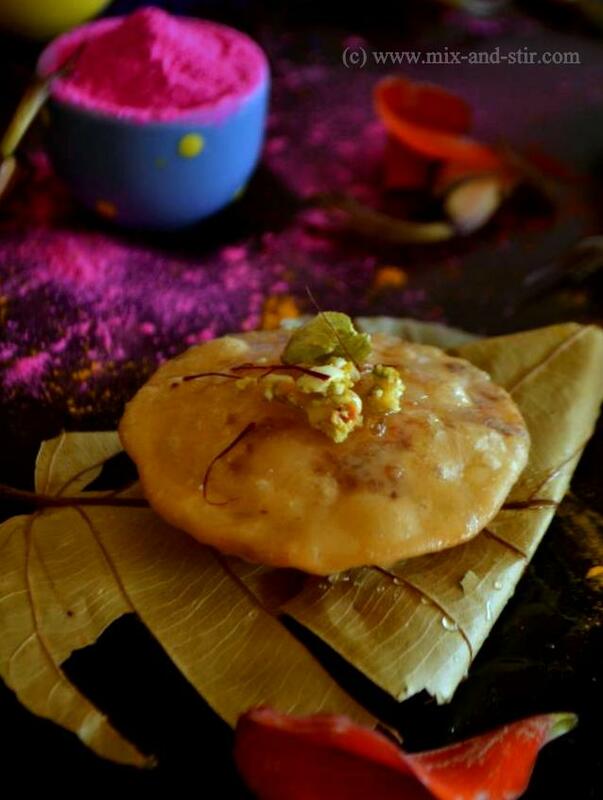 Today what I am going to share the recipe of Keer r Kochuri / Mawa Kachori that I made during our last festival Holi. Holi/Dol/Basanta Utsab is the festival of colors. It comes in Spring, the season of love. 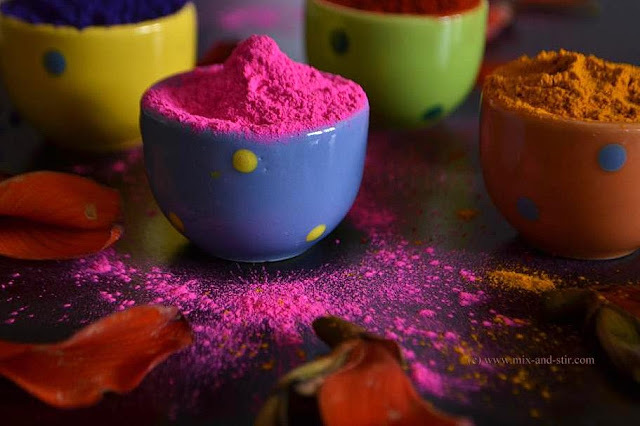 Holi, one of the most popular Indian festivals, which is celebrated with colors (abir-gulal-pichkari) in almost every parts of India. This year we celebrated Holi in San Diego too as we used to do in our home-town. 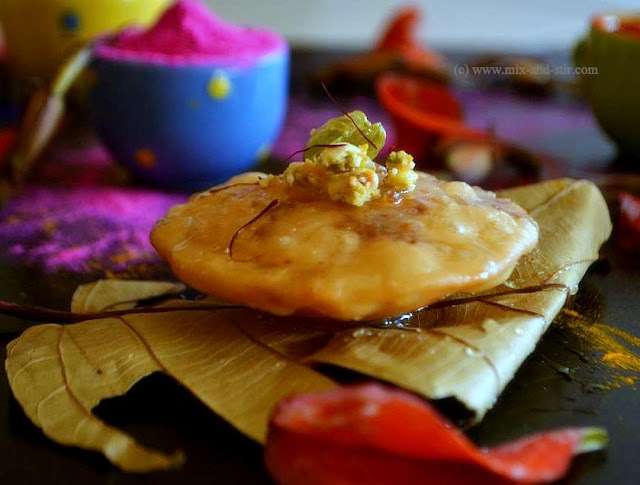 From our childhood I used to see my mom making special snacks or sweet at kitchen on the day of holi, starting from 'ghugni', 'Singara' to 'Jalebi'. These days my blogger-friends are giving me enough inspiration to make some special food on the special days. 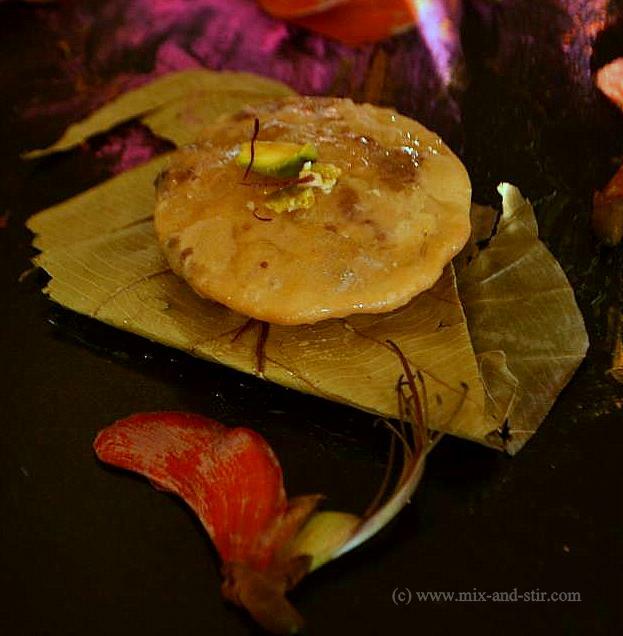 So I made up my mind to make Mawa Kachori which will match with the Holi’s festive spirit ! This is called Kachori in Hindi and Kochuri in Bengali. 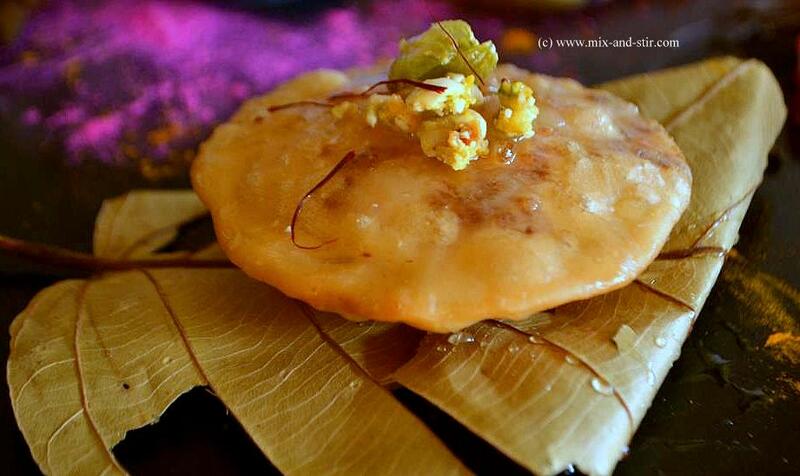 Mawa Kachori is one of the mouth-watering desserts from Rajasthan. We get almost the same thing in our Kolkata, which we call 'kheer r Kochuri' or 'Kheer r Chop', one of the popular desserts available in most of the sweet shops. 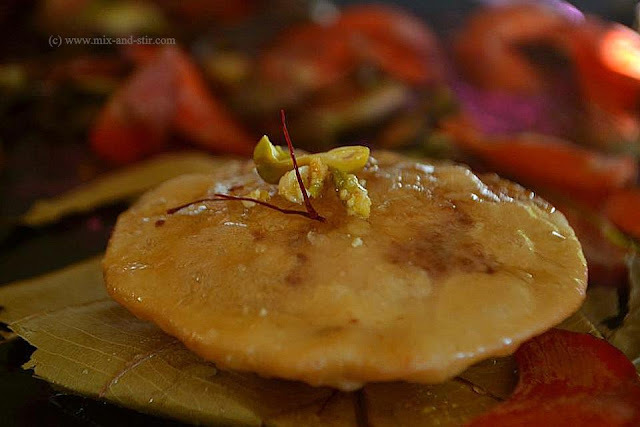 It is a deep-fried dessert, pastry filled with kheer(solid milk) and nuts drizzled with hot syrup. Though it is a deep-fried food, I can assure you that it would absorb very less oil. I used dry Kheer for the filling but you can use mawa mixed with sugar and chopped nuts for the same. Irrespective of the filling, the taste remains awesome always. 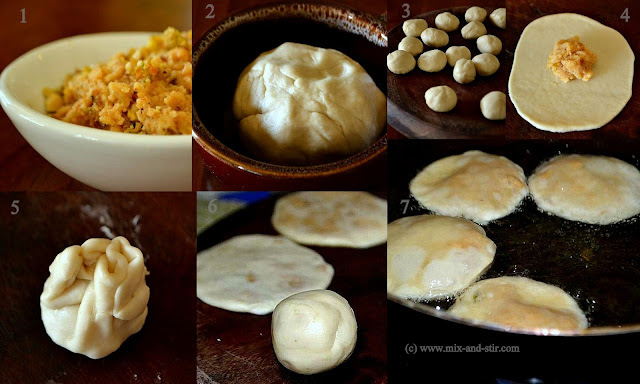 From the below steps, you may feel that the process is lengthy but when you start making it, would feel it is lot more easier than the other kachories like peas - Kachori and all. Boil the milk in a heavy-bottomed pan on low flame . Stir it occasionally .When it reduces 1/4 in quantity add the sugar. Stir it again and again so the mixture does not burn on the bottom of the pan and make it more dry. Add the chopped dry fruits and let it cool. Filling is ready. In a bowl, take flour and clarified butter. Make firm but soft dough by adding water slowly as needed. Knead the dough with your palm until the dough becomes soft and smooth. Keep the dough aside and cover it with a wet cloth. Let the dough rest for at least 7 to 10 minutes. Boil the sugar and water on medium heat. When sugar starts to boil, add the saffron and cardamom. When the Syrup is about one thread lower the flame, add the vinegar. 1. Knead the dough again for 2-3 minutes and make 18 equal balls out of it. 2. Roll out each ball into 2 inch diameter. Don't make it too big. When it becomes bigger, it gets thinner too and there will be a chance that the filling would come out. 3. Put about 1 tbsp of filling in the center of it. Seal the edges to wrap the filling . Do the same process for all the balls. Rest the filled balls for 4 to 5 minutes. Once again try to give them round shape. 4. Heat the oil in a deep-frying pan. Keep the flame on medium high. Place the filled balls on a flat surface and gently press them with your palm and flatten them into 3 inches circle. 5. When you would flatten the balls, make sure the sealed or closed mouth of the balls should be up. 6. Check the oil, when it is ready, slowly drop the kachories in the oil. Fry them on medium heat. 7. In one batch, maximum 4 kachories you can fry together. Once they are puff, turn on the other side. Fry them to golden brown on all sides. Kheer r Kachori / Mawa Kachori or Kheer r Chop is ready!! 8. You can dip the fried kachories into the hot syrup for a minute and serve it or place the kacharies on a serving plate. Drizzle some hot syrup on it. Sprinkle some chopped dry fruits. Enjoy! its mawa kachori.. bt in filling u hvnt added mawa..? so we dnt hv to add mawa.. justing boiling milk n sugar?